Centralized Management allows the user to easily manage their entire backup solution from one centralized location. This feature allows backup administrators to easily tell if a backup contained any warning or errors, without having to manually go through each backup log. It also gives an overview of backups that are currently in process and backups scheduled in the future. Once connected to a database, a new tab will appear in the ribbon. Select the Manage tab, and click "General" / "User Interface." Fig. 2 - Accessing UltraBac User Interface options. Deselect "Sync between Managed Machines and the UltraBac Database list." Fig. 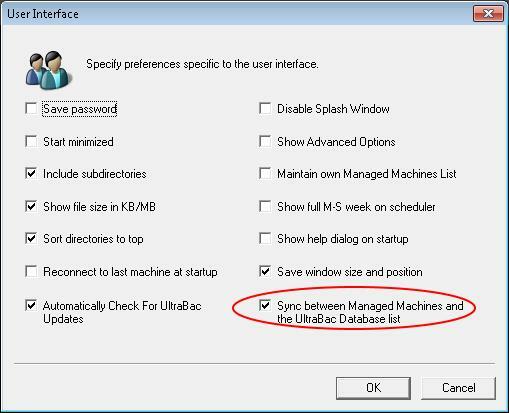 3 - Option to Sync Managed Machine list to the UltraBac Database. Within Centralized Management, you have the ability to specify the refresh rate, cutoff times for past and future jobs, the number of minutes without contact before considering a machine offline, and how many completed and future jobs to display. Select the Centralized Management tab and click "Options." Fig. 4 - Centralized Management Options. From the Overview tab you can see total "Jobs in Progress," "Jobs with Issues," "Pending Jobs," "Completed Jobs," as well as "Offline Machines." If it is the first time a job is being run, time remaining will show up as "N/A." Subsequent backups will report the time based on previous backup times. Fig. 5 - Jobs in Progress. If there are any jobs with issues, you can right click on the job in question and select "View Log." This will open the log in a new tab. Fig. 6 - Jobs with Issues. Fig. 7 - Pending Jobs. Completed Jobs will show all jobs including those with issues and, as with "Jobs with Issues," you can right click on a completed job and select "View Log" for the backup in question. Fig. 8 - Completed Jobs. Offline Machines will list the server name and the last time it checked in. Fig. 9 - Offline Machines. The list is sorted based on Managed Group name and then the servers within each group. A server can be part of multiple groups. The list is also color coded. Selecting currently running or future job will list details about the job including: server name the backup will be run on; scheduled file name; start time; and, if available, an estimated run time. Fig. 10 - Machine View of first job run. Fig. 11 - Machine View with estimated time to completion. If the job has finished running you will see the backup log in the right pane. Fig. 12 - Completed job with backup log. The reports will contain a summary of the jobs that have been run between the report frequency. If a report is created to run every Monday, the report will contain a summary of all backups since the previous report was run. To create a new report click "Centralized Management" / "Reports" / "Create New." Select the servers to be contained in the report. All Machines – Report will contain all computers in the database. Machines – Report will only contain the computer(s) that are selected. Groups – Report will contain all computers in the group(s) that are selected. 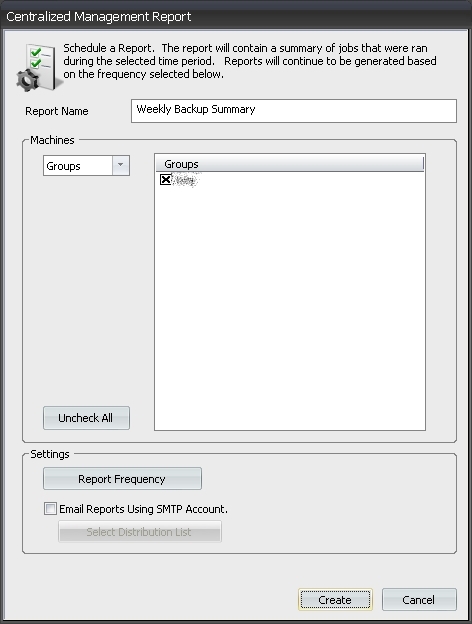 Click "Report Frequency" to open UltraBac Scheduler to set the report start time, date, and event frequency. Check "Email Reports Using SMTP Account." to send the report as an attachment to the user(s) and/or group(s) specified in the distribution list.. Fig. 13 - Creating a new Centralized Management Report.